Waiting for the off for a clockwise trip around the Four Counties Ring starting at the friendly and attractive Stafford boat club site. Two boats Bobbles and Tophyl arrived yesterday and had a very pleasant evening with club members in their impressive clubhouse. Another boat Sloe and another crew member for Bobbles arrive today. Around lunchtime, all ready for the off. Turning left from the club marina and within a few hundred yards we get to our first lock. No 42 Deptmore. Then we confirm that we can save water by locking with friends and can lock with not just two boats but three, all at the same time! Two Beavers at 24ft and an Otter at 20ft (with engines) ~ 68ft! 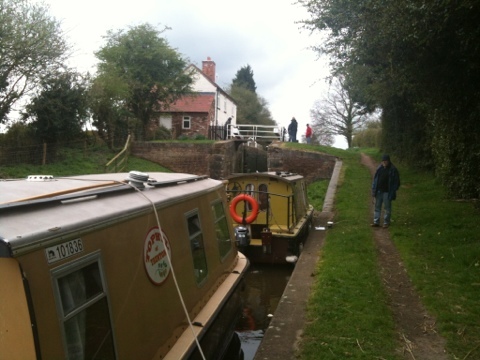 Then onwards and upwards, climbing through ten more locks, finally past Gailey top lock and on just past the Hatherton branch to moor for the night. A wet and cold day but finished with all seven of us sitting down in Bobbles for a welcome lasagne, salad and a nice red wine. A wild night and woke to snow, sleet and rain all at the same time with gusts of wind rocking the boat. An interesting day’s cruising ahead it appears, but only locking down through two locks. 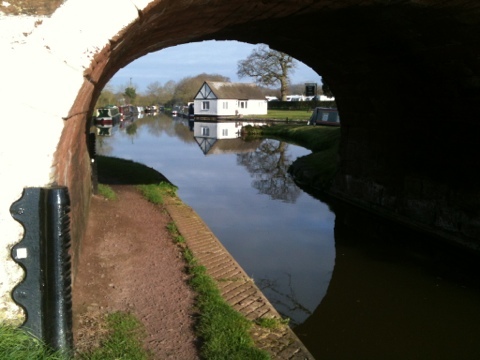 Quite quickly we are finished with the Staffs & Worcs canal for now as we turn into Autherley Jcn on to the “Shroppie” and on through Autherley stop lock. Up to now the wind has mostly been behind us but now we are heading into it and the odd passing sleet or rain shower. All wrapped up in 3 or 4 layers and looking a bit like Nannook of the North, we press on to a lunch stop near bridge 8 for some much needed warmth and sustenance. Then looking at our emails there are some from Waterways. One saying the Trent & Mersey is closed due to fallen tree near Stone and the three in quick succession for the Shroppie. Closed at bridge 29 due to fallen trees, and restricted width closer to us due to more trees down. (Have to say the Waterways email alert service is a very useful as long as you can get a mobile signal.) 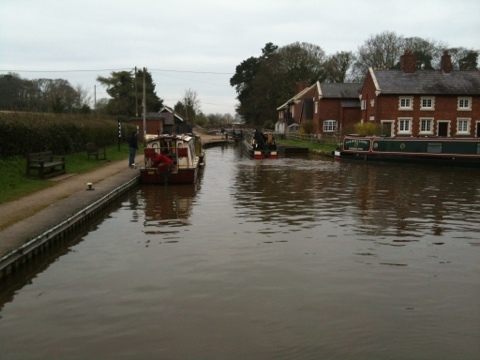 So we just move on to Brewood and stop in the cutting out of the wind for a visit to look around the town for shops etc and to book an evening meal at the pub to celebrate one of the crew’s birthday. Then we can see if they can clear the blockages by tomorrow. Oh no, checked again and another tree down further on, closing a lock!! No quick trip this! Off and running. 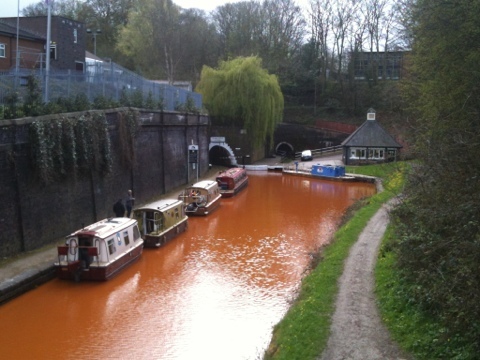 Blockages appear to be cleared (well done BW) so off to the lock at Wheaton Aston. Then with the sun starting to make an appearance and the wind continuing to drop we move on to Norbury Jcn, which is where Tophyl’s crew hired from many years ago. A much busier place now. Here we received the sad news that Snapdragon and it’s crew wouldn’t be joining us on Saturday. So we continued on to make up for some time lost yesterday, due to the bad weather. On through High Bridge 39, with it’s telegraph pole and the narrow cuttings. Finally we came to a stop at Goldstone bridge and adjourned later on for a beverage or two in the Wharf Tavern. Lots of caravans arriving at the start of the public holidays into the adjacent caravan parks. We come out to a full moon and a cold night. Up earlier than usual to a bright sunny morning and take a couple of pictures of the boats at Goldstone. We are off to tackle loads of locks today. 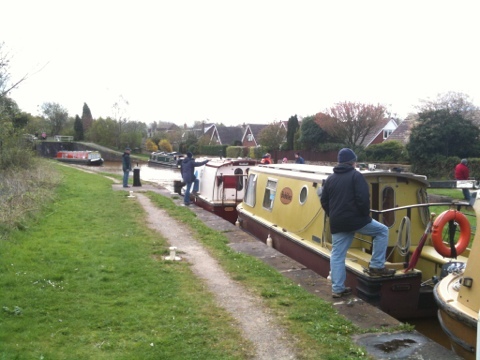 Starting with Tyrley locks we make quick progress with some many crew, and then a stop at Market Drayton and a quick walk into and out of this interesting half timbered old town. Shame that it has so many empty shops. If you need a quick trip to the supermarket, Asda is on the road that crosses the canal. 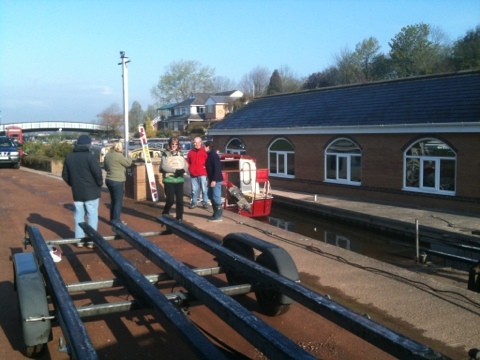 Then on to Adderley and Audlem locks where we met a lady at the top Audlem lock who was selling very nice shortbread and tiffin, then a helpful volunteer lock keeper and a BW lady asking visitors various questions. 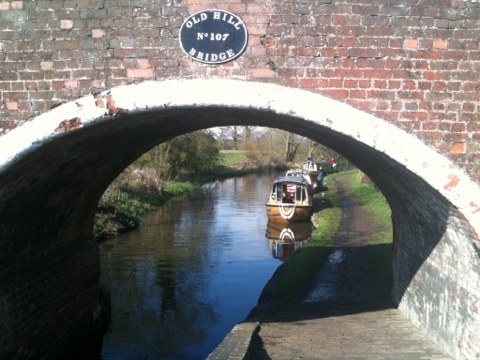 Stopped above lock 12 and then into the Shroppie Fly (good job we booked!) for a very nice meal and good beer, excellent customer service, all topped off by some live rock music. Time for bed. Starts damp after some rain. Can’t complain though. We need it. An easier shorter run today starting after some crew had visited Audlem mill for some goodies. Passing busy Nantwich, Boobles and Sloe stop to investigate the town but Tophyl continues on towards Barbridge Jcn. Weather has got better through the day, with the sun making an appearance now and then. Lots of boats out and about, must be a holiday! Stopped opposite The Old Barbridge Inn and visited for an evening meal (again good job we booked!). Very good meals especially the Steak and Ale pie. Sloe were off early to get some petrol from further down the canal past the Jcn but by the time the others were moving, the day was getting brighter. Sloe was slightly delayed by a motor boat and butty and a new hireboat but we were soon moving along the Middlewich branch. We wanted to stop at the Venetian marina to look in at the chandlery, but it was empty as a part of Wilton marinas take over and refurbishment. They have also taken out the slipway there, to get more boats in. There is a slipway at the new marina called Aqueduct just a little way along the cut which might we worth investigation. We are told by a local that they do a great breakfast, which might also be worth investigating another time. 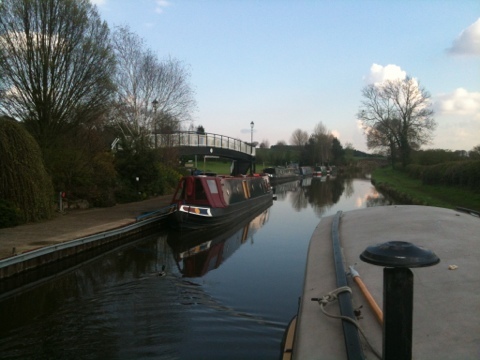 We reached Middlewich without incident and after running through the shortest canal on system, the Wardle canal. 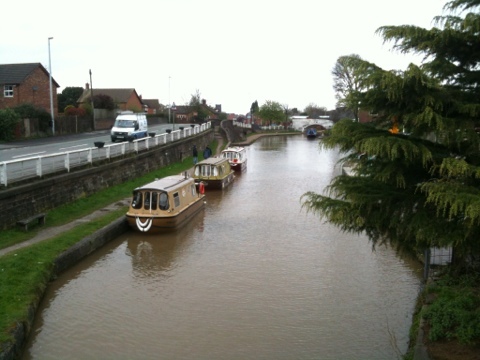 It consists of just one 72ft-long lock plus a few yards of canal on each side and is located just before the junction. We turn right down the Trent & Mersey. At which time, Tophyl picked up the first plastic bag of the trip. Then we pressed on past our target for the day as the forecast for Bank Holiday Monday was not good. 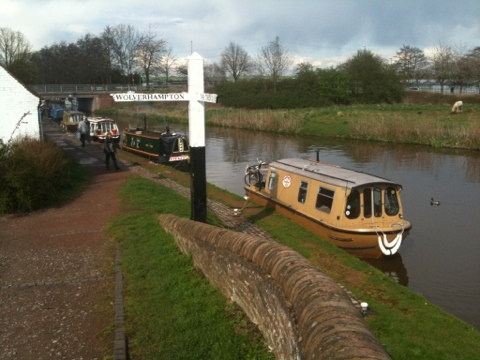 Eventually we opted for a country mooring just before Wheelock. Being that it was a bank holiday of course it started to rain just after midnight and it was still raining when we arose, with a forecast to rain and blow all day. Of course we still can’t complain as we all need the rain. Only a short target today, Hassall Green. The rain lasted till around 4pm but was not as heavy as forecast. We made good progress to Hassall Green looking to adjourn to the Romping Donkey BUT it is no more, just rapidly becoming a pile of bricks. 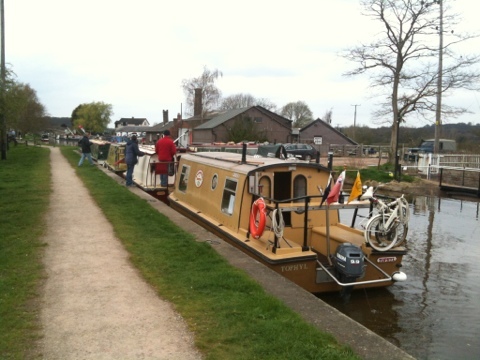 We moved on into the country through Pierpoint locks and called it a day. But one member of Bobbles walked on and found the Broughton Arms in Rode Heath and we moved on to there as it had stopped raining by then. On the way we passed the site of the now long gone metal framework lock 53 at Thurlwood. Good meal at the pub but some minor problems with local youths hanging around the outside of the pub until it started to rain! 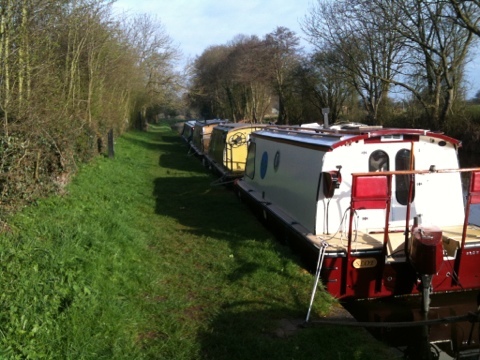 Woke to sunny intervals, After a night with showers, an angry swan and ducks tapping the hull. A slight hiccup with the start this morning with Boobles suffering a flat battery. 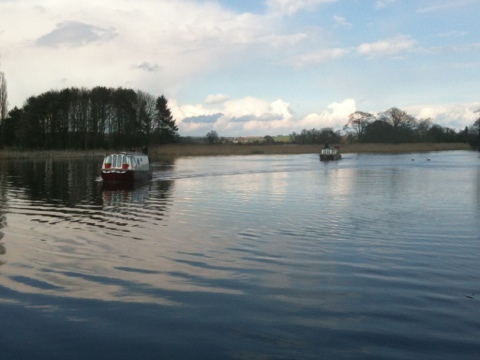 Lucky you can hand start our outboards unlike a modern diesel engine. 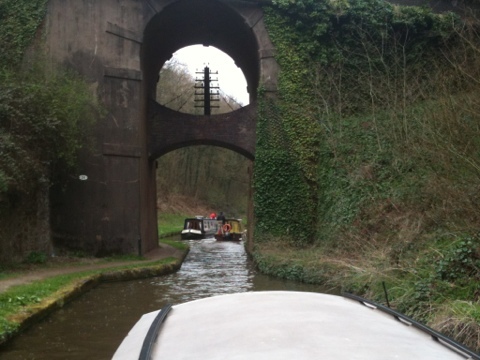 Off to climb 12 locks today up and through Harecastle tunnel and on to Stoke on Trent. 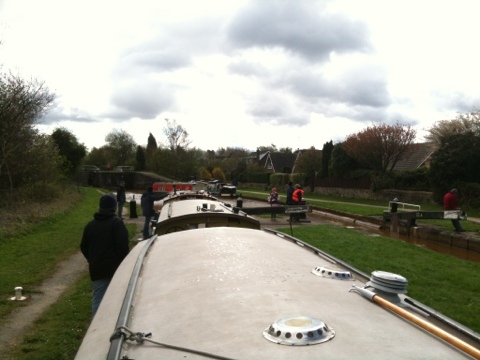 A queue at Lawson treble locks was reduced at the first set of double locks by using both locks but the second set only has one working so no advantage was gained in the flight. As we climb, the wind starts to make handling awkward but we are lucky that the heavy showers that we can see approaching, pass each side of us. 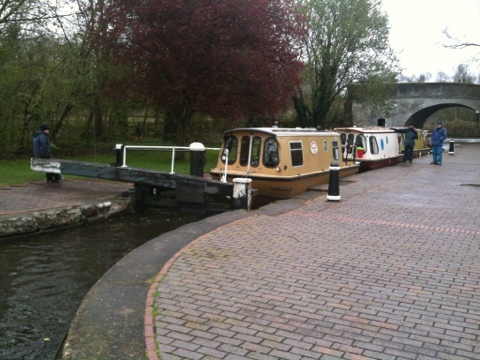 The boats ahead make things slow at Church Locks but they all stop before lock 46 so we speed up over the last 6 locks up to Harecastle tunnel level, where we have to wait around 50 minutes for entry. Time for lunch. Smoked salmon on brown bread courtesy of Bobbles. We don’t slum it in this group! Whose got the champagne? Then we find out that petrol boats have to go first, Tophyl at the front. Must have a working tunnel light and horn. Quick test, no horn. Repaired but as we enter the tunnel it just about squeaks so is handed a gas fog horn by BW staff. What a nice man. Then we cruise through quickly in around 30 minutes. On through the suburbs of Stoke on Trent past the few remaining bottle kilns. 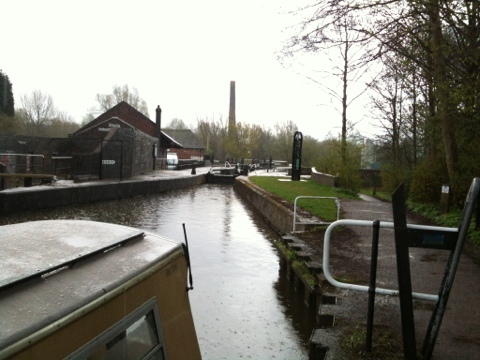 Finally we arrive at Etruria and stop for the night on the Caldon canal besides the statue of James Brindley, who believe had something to do with canals! Wake up to rain but after a peaceful night. Rain clears up in time for Bobbles to hand start their engine again, luckily it’s fine during the day. 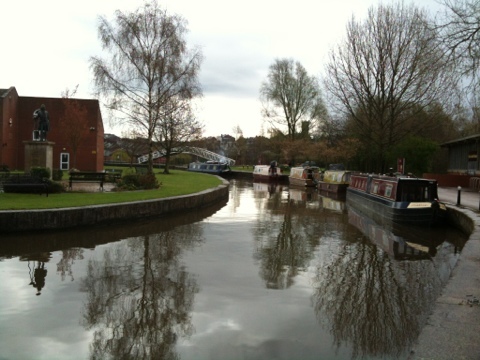 Then on for a day of descending 14 locks and 9.5 miles to Stone. Easy trip through Stoke on Trent, mostly through old factories or modern warehousing. Tophyl picks up second plastic bag of the trip. 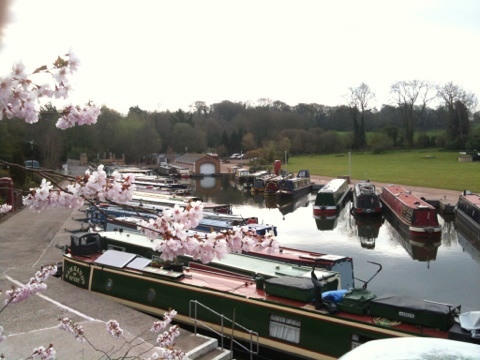 Weather good and we get to Trentham lock 35 and make the decision to go for trip around the Wedgwood factory. Arrived by bridge 104 and just had time to tie up before the heavens opened with hail and thunder. After 30 mins off to the factory. Interesting place that is still open for business and producing their high quality wares, unlike so many other English pottery based businesses, many of which have moved overseas. Back around 4pm for the run down to Stone, where we arrived around 6.15pm. 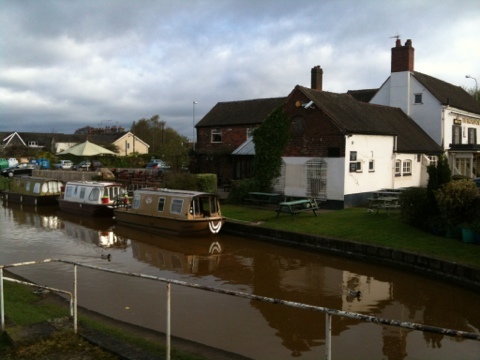 Here we are at the home of the Trent and Mersey canal and go for a meal in the famous canal horse changing pub, the Star, beside lock 27. 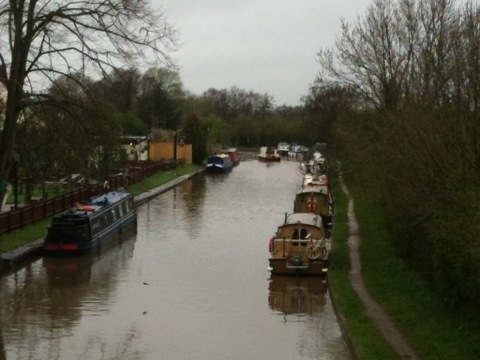 Lots of boats here though so quite a walk back to the pub. 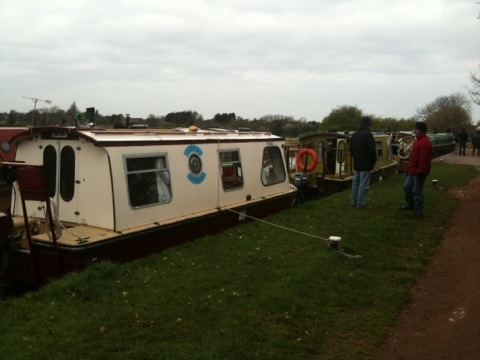 Sun is out though and birds are singing and we are on a boat! All’s right with the world. Had a good meal last night at the Star and a quiet night. A dry start to our last day of cruising with the sun trying to make an appearance. 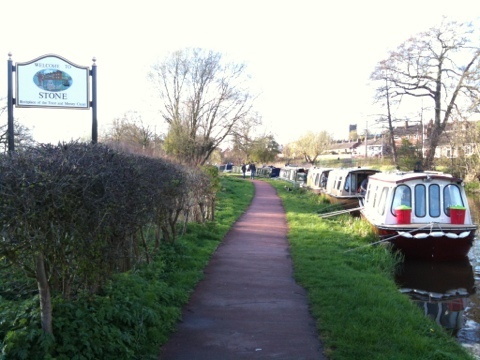 Sloe has had charging problems whilst away and has had a battery charge off Tophyl this morning, whilst some members of all crews went for a walk into town, then off for around 15 miles and 5 locks back to Stafford boat club. Easy cruising with the weather set fair but with black clouds building around us. Looks like Stafford and perhaps Nottingham are taking a pasting. We stop for a brave lunch. No sooner than putting out deckchairs than it starts to hail and thunder. Ten minutes later and we are out again with tuna sandwiches, G&T’s in coats and hats and gloves. Just as we finish here comes the hail again. Too late the G&Ts have been drunk and we don’t need the ice now! We move off as the sun comes out again and arrive at Great Haywood junction and buy an ice cream. 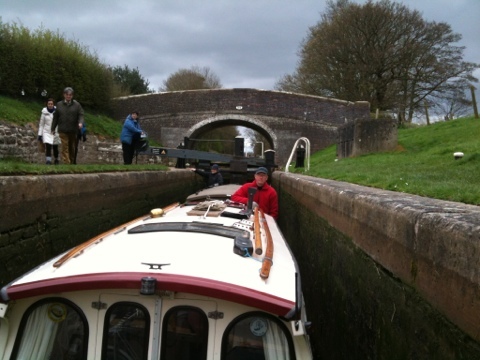 A left turn and we are back on to the Staffs & Worcs canal where we started from ten days ago and within a short while we are on Tixall Wide but no time to stop today. Then on to our last lock with new born lambs in the field alongside the lock. Then we meander along the canal skirting Stafford back to where we started what in some way feels an age ago but in other ways just yesterday! A final meal all together in a local Sizzlers pub and then back to watch an interesting DVD in the busy Stafford Boat Club clubhouse of how the club site was developed by the hard work and imagination of many members over 40 years. Then to bed. 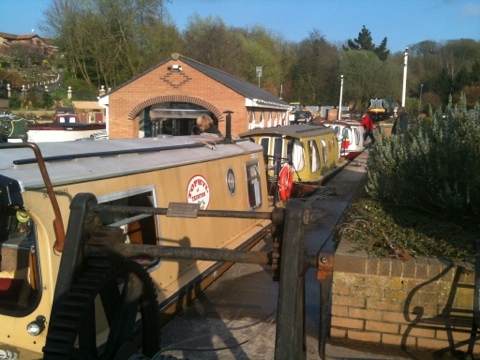 Frosty clear start to getting the boats on to the trailers and away home. A great holiday of good company and food, mixed weather and battery charging but mostly some stunning views of beautiful countryside. We’d forgotten how nice these canals are in the many years since we last cruised them. We mustn’t leave it so long till the next time. Finally a sincere thank you to Stafford Boat Club for making us so welcome. We hope to visit you again someday soon. This “blog” will be updated with some more photo’s next week.